The weather has really made a turn in the last time. During this week there have been two gales by the name Gorm and Helga. When we really have some windy gales we give them names in Denmark. The weather in Denmark is right now really grey and rainy, and it become darkness really early. Yesterday I was wearing this outfit. I love to build layers up in my outfit, when the weather is like this, windy and cloudy. Sometimes it is also necessary, because it has really become cold here in Denmark and I’m a icicle on two legs. I have chosen to style this outfit very neutral, with grey and black. I really like to use the sweater and shirt style, because I think it gives the outfit some lovely details, especially if you use a colorful shirt under the sweater. The leather jacket is classic and can always be used in a outfit. Do you like to shirt and sweater style? Tomorrow begins VM handball and Denmark is host for the games. I’m crossing my fingers for Denmark. Some of the matches are going to be played in my hometown, so I’m going to watch the match at the arena, which I REALLY are looking forward to. Vejret herhjemme i Danmark har virkelig ændrede sig. Der har på under en uge været to storme, Gorm og Helga. Vejret herhjemme er virkelig trist, når det bare er gråt og blæsende, derudover bliver det alt for tidligt mørk. Forleden dag var jeg iført dette outfit. Jeg elsker at bygge lag op i mine outfits, når vejret er sådan her. Trist, gråt, blæsende og bare kedeligt.. Det kan også være nødvendigt, når man som mig er en istap på to ben. Jeg har valgt at holde dette outfit i neutrale toner, gråt og sort. Jeg kan virkelig godt lide at bruge en skjorte under en trøje, da jeg synes det giver nogen fede detaljer til outfittet. Især hvis man bruger en farverig skjorte under trøjen. Hvad synes du om, skjorten under blusen stilen? I morgen begynder VM håndbold og Danmark er vært for kampene. Jeg krydser fingre for Danmark. Nogle af kampene bliver spillet i min hjemby, derfor skal jeg selvfølgelig hen og se nogle af kampene, hvilket jeg virkelig ser frem til. It is December and I’m counting down for Christmas evening or trying. My advent candle is a day behind, but then it is like always. For me December is going to be a bit busier than usually. I’m going to use the most of the month on my big school project and besides the paper there is a lot of things to do. I still have to find some Christmas present to my beloveds and I want to spend time with them. I want to enjoy their company by baking Christmas cookies and eating Danish doughnut – a really classic Christmas snack/dessert -. For the last couple of years my mom has given me a perfume for present. She really has a surprising good taste, when it comes to finding perfumes. I believe a perfume can be a great present because It is something you can use and for relative long time. Even though I have a lot of perfumes, I wouldn’t mind finding a perfume more under the Christmas tree. Midnight Rose from Lancôme has an intense, sensual and seductive scent. I love using this perfume when I’m dressed up and going out. 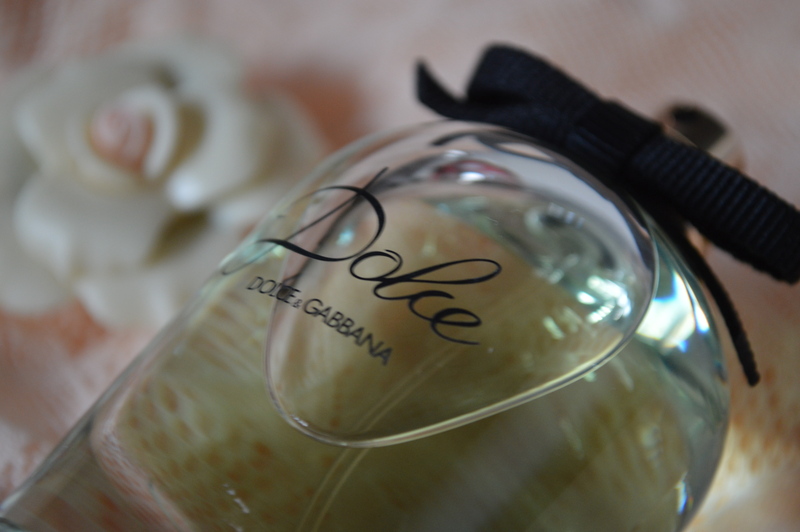 Dolce from Dolce & Gabbana is actually not a perfume I have got, but a perfume I bought this summer in Hong Kong. The perfume reminds me of hot spring and summer days, with summer dresses and ice cream. You can read more about the perfume here. Honey from Marc Jacobs a light and full of enjoyment. This perfume has a tempting flower scent and a touch of Honey. In Love by Lancôme is a feminine floral scent, with a touch of fruit. The perfume is a symbol of a women’s first love. This perfume is seductive, delicate and unforgettable. Which kind of perfume do you prefer? I’m so in love with this perfume, so If you don’t know what you should give as present this year to your sister, girlfriend, mother or yourself. Then I will say you should give them the perfume Dolce by D&G. I bought the perfume in Hong Kong this summer. When I saw the perfume I was already in love. The design of the perfume is so beautiful and lovely, and the scent of the perfume was just pure heaven. The perfume is very feminine and delightful with is scent of white flowers, freshness of neroli leaf and a hint of papaya flower. This combination of the scent goes right in to my heart and melts it. This perfume reminds me of spring and summer, where the grass is high and the flower is in full bloom. I can truly recommend this perfume if not for you, then as a present for your sweetheart. Hvis du ikke ved, hvad du skal give din søster, din veninde, din kæreste, din mor eller dig selv, i gave i år, så ville jeg anbefale Dolce af D&G. Jeg købte parfumen da jeg var i Hong Kong i sommers. Da jeg så parfumen, var jeg allerede forelskede i den. Designet på parfumen er så smukt, og duften af den er ren kærlighed til den. Parfumen er feminin og dufter fantastiske med dens sammensætning af hvide blomster, friskhed fra neroli blade og et strejf af Papaja blomster. Denne kombination af duftene går lige i hjertet på en, og smelter det fuldkommen. Parfumen minder mig om foråret og summer, hvor græsset er højt og blomsterne står på og svajer i vinden. Jeg kan virkelig anbefale denne parfume, hvis ikke til dig selv, så til din allerkæreste.